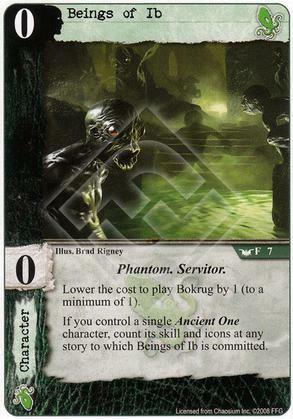 Lower the cost to play Bokrug by 1 (to a minimum of 1). If you control a single Ancient One character, count its skill and icons at any story to which Beings of Ib is committed. "No one is that lucky!" 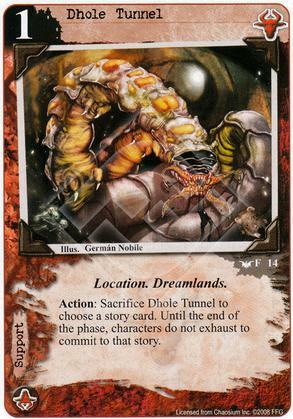 Action: Sacrifice Dhole Tunnel to choose a story card. Until the end of the phase, characters do not exhaust to commit to that story. 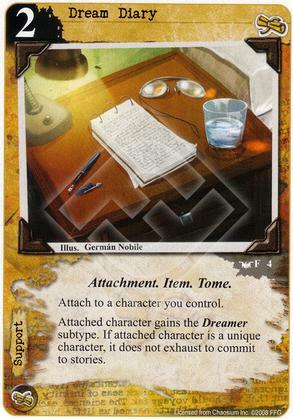 Attached character gains the Dreamer subtype. If attached character is a unique character, it does not exhaust to commit to stories. Night. It is Night. 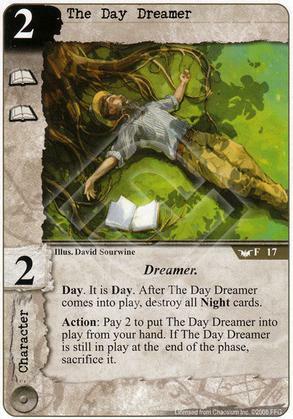 After Dreamlands Wanderer comes into play, destroy all Day cards. 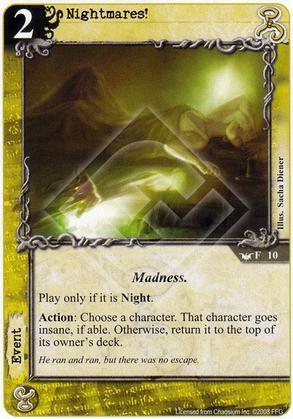 Action: Pay 2 to put Dreamlands Wanderer into play from your hand. 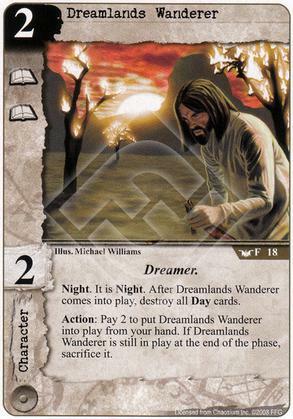 If Dreamlands Wanderer is still in play at the end of the phase, sacrifice it. Raise the cost for opponents to play Day cards by 1. 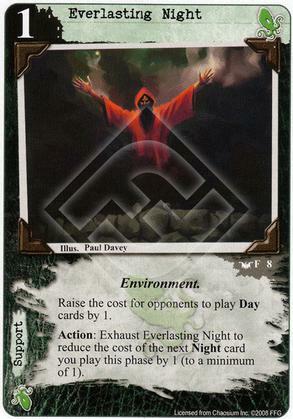 Action: Exhaust Everlasting Night to reduce the cost of the next Night card you play this phase by 1 (to a minimum of 1). 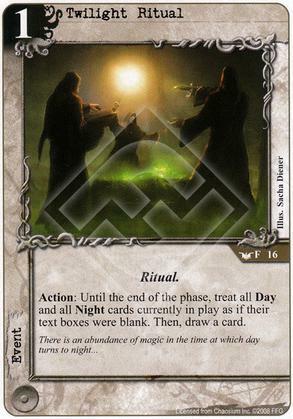 Raise the cost for opponents to play Night cards by 1. 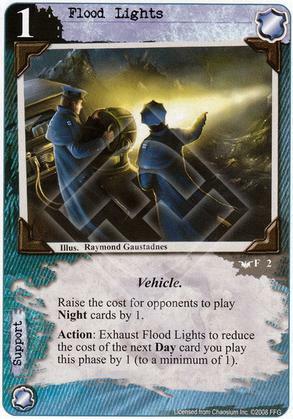 Action: Exhaust Flood Lights to reduce the cost of the next Day card you play this phase by 1 (to a minimum of 1). If it is Day, Furtive Zoog gains (I). 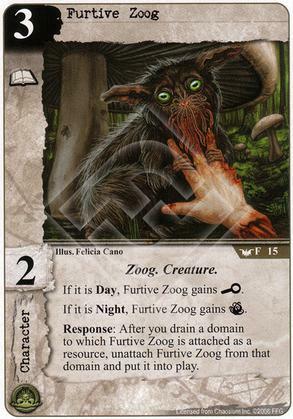 If it is Night, Furtive Zoog gains (T). Response: After you drain a domain to which Furtive Zoog is attached as a resource, unattach Furtive Zoog from that domain and put it into play. If it is Day, Gregory Gry gains Willpower and Toughness +2. 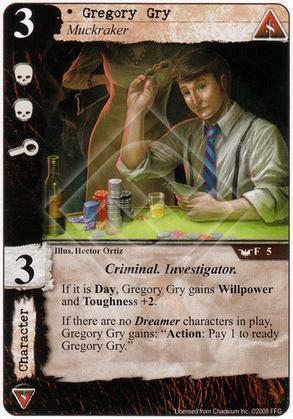 If there are no Dreamer characters in play, Gregory Gry gains: "Action: Pay 1 to ready Gregory Gry." 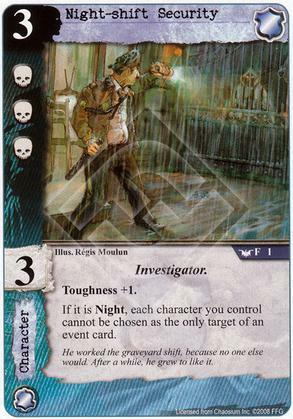 If it is Night, each character you control cannot be chosen as the only target of an event card. He worked the graveyard shift, because no one else would. After a while, he grew to like it. Action: Choose a character. That character goes insane, if able. Otherwise, return it to the top of its owner's deck. He ran and ran, but there was no escape. 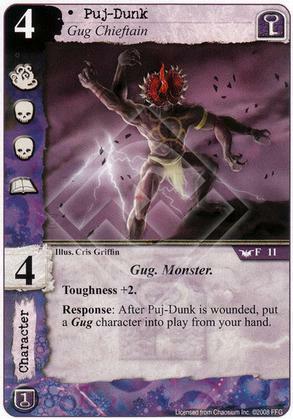 Response: After Puj-Dunk is wounded, put a Gug character into play from your hand. Action: Until the end of the phase, (T) icons do not protect characters from insanity. But what frightens the frighteners? Day. It is Day. 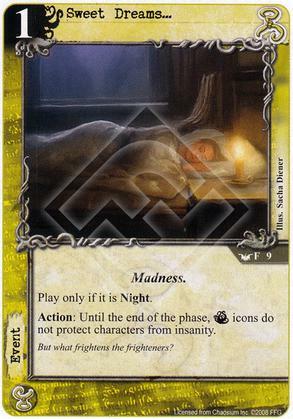 After The Day Dreamer comes into play, destroy all Night cards. Action: Pay 2 to put The Day Dreamer into play from your hand. If The Day Dreamer is still in play at the end of the phase, sacrifice it. Day. It is Day. 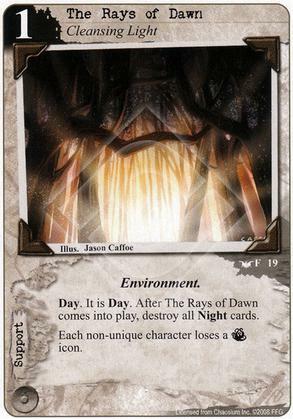 After The Rays of Dawn comes into play, destroy all Night cards. Each non-unique character loses a (T) icon. Night. It is Night. 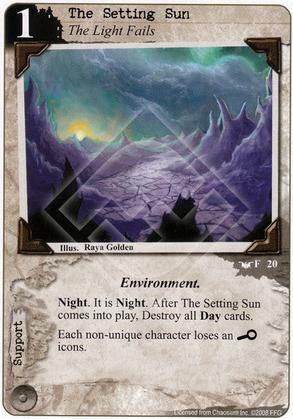 After The Setting Sun comes into play, destroy all Day cards. Each non-unique character loses an (I) icon. 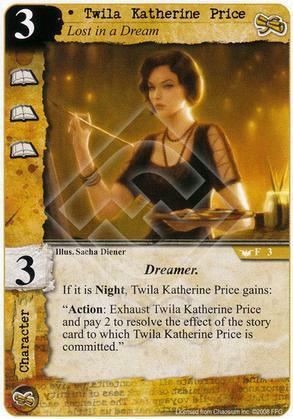 If it is Night, Twila Katherine Price gains: "Action: Exhaust Twila Katherine Price and pay 2 to resolve the effect of the story card to which Twila Katherine Price is committed." 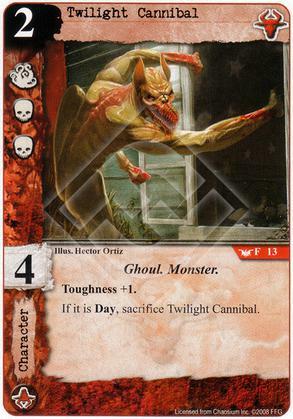 If it is Day, sacrifice Twilight Cannibal. 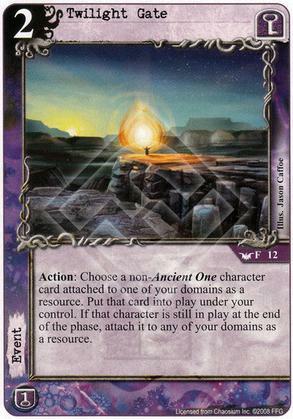 Action: Choose a non-Ancient One character card attached to one of your domains as a resource. 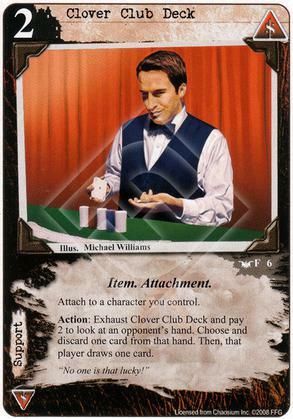 Put that card into play under your control. If that character is still in play at the end of the phase, attach it to any of your domains as a resource.